Residence: Skowkale First Nation, Chilliwack, B.C. 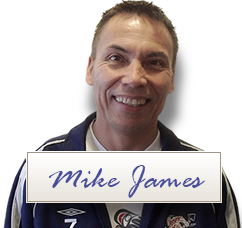 Mike James was born and raised in the Chilliwack area. Granny, Teresa Michelle raised him from birth until he was 11; at that time he moved to his parents, Mary – Lou and Gerald Sepass from Skowkale First Nation located in Chilliwack, B.C. Upon his arrival with his parents, Mike worked all through school and following completion of school worked in various labor jobs. In 1985 he began his double career, his first priority was to become a “Mr. Mom” to his daughter Collette, Collette was born February 25, 1985; Mike raised his daughter as a single parent. Mike also began his career in the “helping field” on January 7, 1985; Mike was hired by the Chilliwack Area Indian Council as a Youth Coordinator. Over the next few years he was trained as an Alcohol and Drug Counselor, Facilitator and Trainer of Trainers. Mike had found his “calling” in life; his ability to connect with the Youth and make a positive impact on their lives was extra ordinary. Throughout these years Mike Toured North America delivering tailor- fit, community based, self-help programs. Recognizing his ability to help not only First Nations People, but all Nationalities, young and elderly, Mike began his business delivering these programs independently under his company, Xwelmexwalh Sewolem, (now known as All Aboriginal Healing & Native Games Program); he continues to do so to this day. By 1987 Mike was nominated as a National Native Role Model by the National Native Alcohol and Drug Abuse Program. In 1988 Mike moved to Prince George to work as an Alcohol and Drug Counselor for the MTS Mobile Treatment Society; he took his turn as “Head Counselor”. Although Mike found his work very rewarding, after 1 ½ years of service, Mike chose to move back home. Mike was never one to sit around unemployed, so in 1989 he took a job as the Program Manager for the Skowkale Salmon Enhancement program. Mike never forgot his calling; with daughter, Collette In one arm and equipment in the other, he continued to travel North America delivering self-help programs. When Collette entered school, it was important to maintain home stability for Collette; Mike Choose to slow down his community travel to provide this stability. Mike was gifted with his second child at this time; Mike’s younger daughter, Larissa was born on August 3, 1990. At this time Mike began delivering Native Awareness Programs in the Correctional System and continued to do so for the next 16 years. To date Mike has provided services in 12 Correctional Institutions; he has delivered programs in the Juvenile, Provincial and Federal systems and at security levels ranging from, minimum security to maximum security. Delivering weekly programs with inmates sharpened his skills and added in depth knowledge of the needs of our Society. Without his knowledge, several of Mike’s Elders were watching him and within the next few years, Mike was honored by his Elders; he was put through 3 Sacred Ceremonies; the first one was to honor him with his first Sacred Bundle; the second was to honor him with his first Traditional name, (Yang go Mazie – Chief of Eagle House) and the third Ceremony was to give him the responsibility as a Sacred Sweat Lodge Keeper. Limiting his work on the National level did not mean putting a stop to his calling; it only meant rescheduling programs around Collette’s schooling. Collette continued to travel with Mike; it gave him a sense of pride and strength to continue working towards his career goal of helping our Native People. Having Collette with him was a reminder to his clients of Family Values and the belief that when there’s a will, there’s a way. So being a single parent does not mean you have to quit your dreams, it only means you have to get creative with organizational skills. On a personal level, Mike is an avid soccer player; he currently plays for 2 teams. Although Mike is dedicated to his work, his children are his priority; he has coached his daughter Collette since she was 7 years old. Mike takes pride in standing on Collette’s sideline coaching her through her games; he became especially proud when she was asked to play for a select Indigenous team that travelled to Spain and Portugal to play. Collette also works at a local Native Child and Family Services Agency. Larissa resides in Edmonton, she has graduated high school and is currently taking a cosmetology program; they maintain consistent contact and is proud to hear that she is getting excellent grades in both written and practical exams. Mike had found a unique and highly successful method of helping individuals become aware and instill a sense of pride in their Cultural Identity, this was through incorporating Ancient Traditional Native Games. These are a series of Ancient games that were originated by Native Peoples all across North America; these games created an awareness of the Sacred Values our Native Ancestors lived by. Aboriginal participants gained a sense of pride; non-Aboriginal participants gained an understanding of how the original people of this land utilized various games to Resolve Disputes, offer respect toward the life-givers, (women) and exercise Spiritual beliefs. On March 7, 1996 the Aboriginal Sports and Recreation Association of British Columbia awarded Mike National recognition of a Master Traditional Coach. On February 27, 2007 Mike and his daughters were honored by his family; they were given Traditional names. Mike’s traditional name is Ketalalten, Collette’s traditional name is Siyamtelst I and Larissa’s traditional name is Siyamtelst II. Since 1985 Mike has collected a vast library of knowledge through training and experience; his formal training through the University of Lethbridge, Nechi’s Native Training Institute and the National Native Alcohol and Drug Abuse Program has built a very strong foundation to deliver services to the Native and non-Native society. Mike is also a Sacred Bundle Carrier and Sacred Sweat Lodge Keeper, these combined teachings has given Mike the ability to provide very powerful and successful programs in the communities he works in. Mike James has a unique method of combining therapeutic counseling techniques with the traditional teaching of his Elders. His focus is not to impose his Cultural teachings but to help participants understand how connecting with one’s Cultural identity is a crucial part of creating a strong foundation for a healthy life. Sharing his experiences as a single dad also makes it easier for participants to connect with him. Participants feel more comfortable and find it easier to discuss issues knowing he can relate with them; participants often state that they are treated like equals and “not talked down to”. Mike James is of Aboriginal Heritage; he is a status Native registered on the Skowkale First Nations Band, Sto:lo Nation, British Columbia, Canada. Mike is a certified Alcohol and Drug Counselor, Facilitator/Trainer; his certification is recognized through Health and Welfare Canada, Medical Services Branch. Mike received his formal training at the University of Lethbridge, Alberta, the Nechi Native Training Institute, Alberta and the National Native Alcohol and Drug Abuse Program, Ottawa. Mike is also a Traditional Native “Bundle Carrier” and “Sacred Sweat Lodge Keeper”. Mike is a recognized Master Traditional Coach, Aboriginal Sports and Recreation Association of British Columbia. Mike utilizes group counseling, Individual counseling, large group discussions, small group work, presentations, Traditional Ceremonies and teachings and therapeutic activities to help participants process unresolved issues. Mike has a unique method of utilizing humor and Ancient Traditional Native Games to help participant’s release tension after processing heavy, stressful, unresolved issues. Mike shares many of his own “life experiences” and “single parent experiences” to help participants understand that he can relate with individuals; this helps participants gain trust, respect and become comfortable in sharing and processing many of their issues. Mike has been delivering self-help programs throughout North America since 1985. Mike is very effective at delivering self-help programs; he has a very positive effect on all the communities he works in. Once he delivers a program in a community, they often request him to return several times, some communities have been requesting his services since his first arrival in 1985.